Christian co-authors and motivational speakers, our mission is to provide hope for mental health anchored in Jesus' promise of etermal life. This is my “baby”. But, as you can probably tell, he isn’t so much a baby anymore. He’s almost six years old. 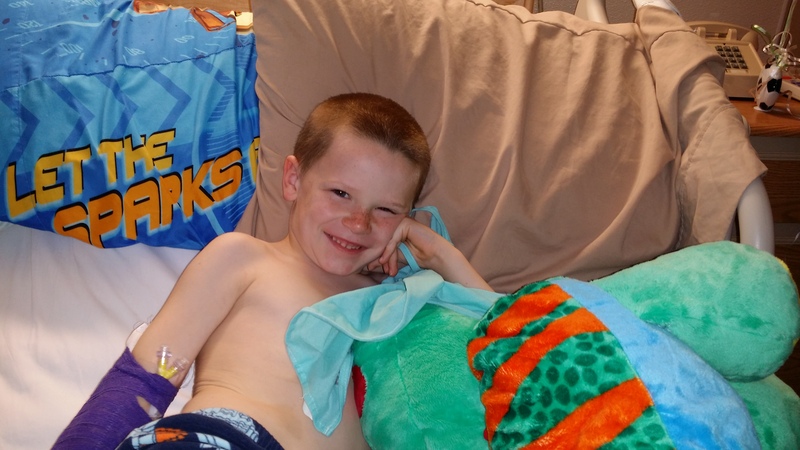 Asher (almost 6) when he was first admitted to his hospital room on 4.16.15. Asher has been the picture of health since he was born. He has only been on antibiotics a handful of times in his entire life and generally gets over illnesses quickly. You can also probably tell that this picture was taken from Asher’s hospital bed. On Thursday night, after Asher had been complaining of a sore neck for a few days, my husband and I found a large and very painful lump had formed on Asher’s neck just under his right ear. Now I don’t know much about lumps that appear out of nowhere, but what I do know is not good. And this lump was very painful. I scooped up Asher and drove the seven blocks from our home to our local Cozad Community Hospital Emergency Room. I could see the terror in Jeremy’s face too; we were in very unknown territory. My mind immediately went to the horrible things a growth like this could be on my child. Is this cancer? What if they can’t get it to shrink and it cuts off his airway? The true issue is that these are real possibilities and have been all too real for too many parents; I didn’t want to be one of them. I’m very proud of myself though. While waiting, it would have been very easy to get on my phone and search “growth in neck” on Google. But I knew what I would find. I would find terrifying and inaccurate information from people providing opinions or asking questions to other unqualified individuals. I resisted the urge to search. As I texted information to Jeremy, who stayed home with our older son, he informed me his research was revealing this is likely an infection and benign. Jeremy could not resist the urge to search, but fortunately he is one who knows where my weaknesses are; he never would have shared terrifying possibilities with me in that moment. He chose to give me hope and positivity instead. My husband and I are complete opposites; where I am strong, he is weak. And where I am weak, he is strong. It works. And I thank God for him every day. 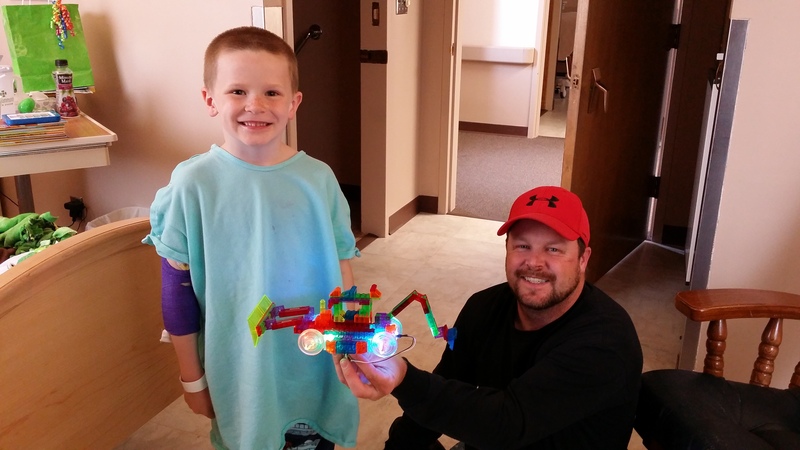 Daddy entertained Asher with legos in his hospital room 4.17.15. Thankfully, I was blessed with a very calm nurse and doctor taking care of Asher. In order to rule out scary options, it was decided we would have to take blood, run tests, and immediately begin IV antibiotics to fight what obviously was nasty inflammation. Unfortunately, Asher’s blood wasn’t flowing easily and the poor kid had to be poked and prodded more than six times in two days to get the samples needed. But, I will make a very long story short and tell you, after two nights in the hospital, Asher’s lump on his neck has decreased in size dramatically. 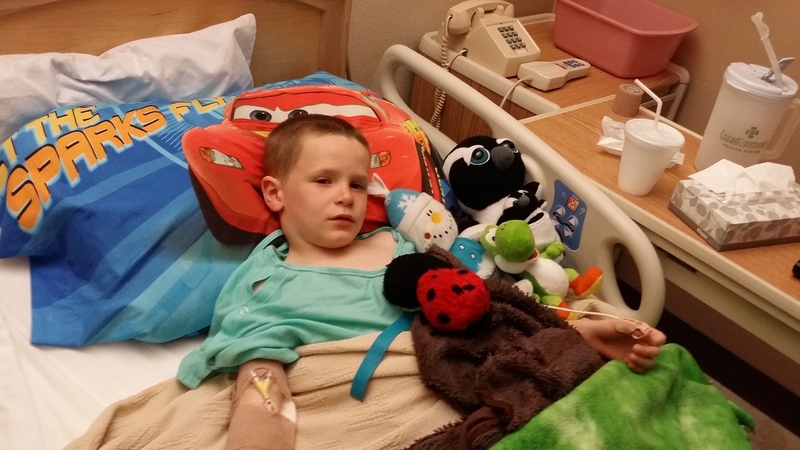 He was diagnosed with strep throat that caused a swollen and infected lymph node. We received amazing care and were truly blessed to have hundreds of friends and family members praying for us as we were terrified for our boy. We are home now, and I have learned a lesson. Slow down. Life has a way of getting very fast and overwhelming. Before you know it, you’re telling your child to hold on for a second while you check for that precious email or post. Life is full of adventures, but the family God blessed me with is my greatest adventure by far. These are the people who will be by my side, and have been, from the most terrifying to the most rewarding experiences. And our ride is not over. So God told me to slow down. We can help others and we can achieve our dreams, but we don’t have to be finished by tomorrow. And we can involve the people who love us and support us the most. We know how precious life can be because we have been forced to imagine what life would be like without those we love. While it sounds excruciating, I recommend everyone do this. Just try it. Picture a life without those people you love. You’ll learn quickly to rely on God, to trust Him, and to be more open than you ever thought you could be in an effort to have more people praying for you and your family in tough times. You’ll learn to let the little things go and put the focus back where it should be. We all need reminded sometimes. Right now I am typing and listening to my five-year-old belly laugh at a movie in our living room. It is the sweetest sound ever and I have been reminded that God surrounded me and blessed me with these marvelous sounds. So I will embrace them. I will not take advantage of them. I will treasure them. I will slow down and live life for God and for my family. Don’t worry, I still plan on saving the world, but with them by my side feeling completely supported and loved. Asher Lane gets to go home 4.18.15!!! ← Curious About Ear Candling? My Family’s Method. I Took My Life. Please Don’t Think I’m Selfish.